This is the latest release from the Dallas Symphony on its own label. It dates from March 2013 during a week of highly acclaimed live performances of the work at the Myerson Symphony Center. 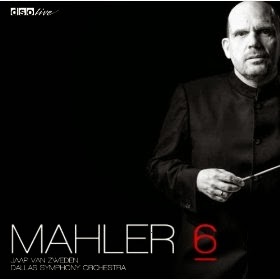 Shortly afterwards, van Zweden and the DSO embarked on a European tour; again the Mahler Sixth was prominently featured. This recording documents the best of both orchestra and conductor. After several seasons as music director in Dallas, van Zweden has been able to add some first-class musicians to the band and to shape the ensemble to his way of making music. The results are extraordinary. It is no wonder that van Zweden’s contract was recently extended to 2019. Van Zweden’s approach to Mahler is very much rooted in the score. Although Bernstein was an important influence on the Dutch conductor, van Zweden never personalizes Mahler the way Bernstein often did. There is emotion, but it is always controlled. Some listeners might prefer a slower tempo for the Andante moderato. Van Zweden moves it along just a little too much to bring out all the beauty of the opening melody. But the final Allegro moderato is devastating in its drive and power. Van Zweden opts for two and not three hammer blows in the last movement, and the engineers have captured those moments spectacularly well.